These Homemade Hotel Chocolate Chip Cookies are akin to the famous chocolate chip cookies that some hotels greet you with upon arrival or serve during turn down service. 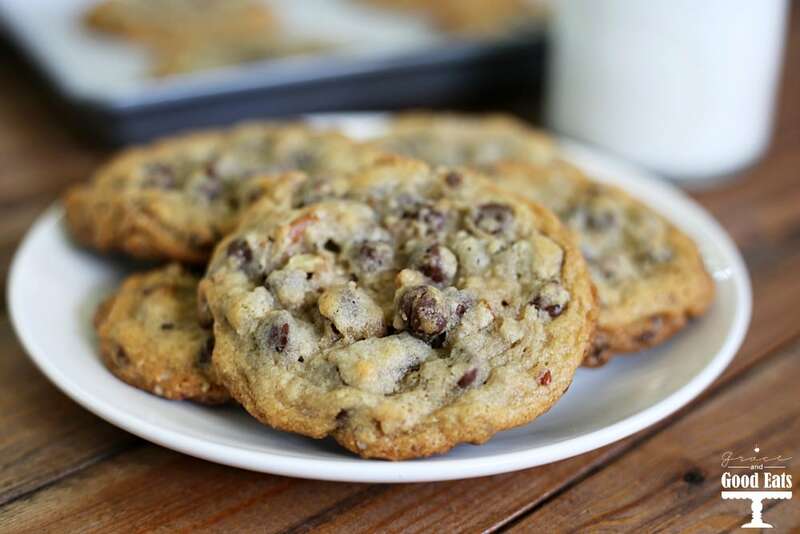 This recipe makes 20 large cookies full of chocolate chips and nuts. This is a sponsored post written by me on behalf of Sam’s Club. This past Memorial Day weekend I managed to pull off a surprise 30th birthday party for my husband that I had been planning for MONTHS. I was 50/50 in the days leading up to it trying to determine if he suspected anything or not. When we arrived at the location, one of the employees at the entrance said “Oh, here for the birthday? There’s tons of people already up there!” Judging by the genuine look of surprise he gave her, I don’t think he had a clue! Sigh. His birthday happens to fall on Memorial Day weekend, so we had a lot of family coming in to visit. My parents live about 1.5 hours away, so they decided to stay the night with us rather than fight the traffic after the party on a holiday weekend. It was our first time using our new “guest room.” Since we recently relocated my office to my Shedquarters, it freed up the room we were previously using as an office inside. It’s more of a dual-purpose craft room and guest room now. I purchased a really nice air mattress on crazy sale a few weeks ago that we use for the bed when needed. Because we keep the sewing machine and family desktop computer in that room, it just didn’t make sense to dedicate the entire space to another bedroom that will only get used on occasion. Though it is a really nice air mattress, it doesn’t quite compare to a real bed on it’s own. I’ve learned that the key to creating a pop-up guest room that your guests will want to stay in all night long and still wake up refreshed is with a quality mattress topper! 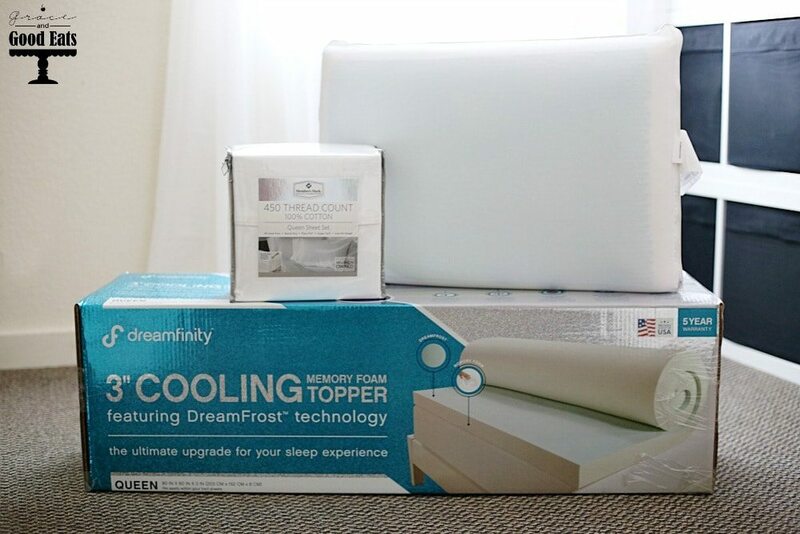 We LOVE this exclusive Dreamfinity™ 3” Cooling Memory Foam Mattress Topper from Sam’s Club (available for purchase in-club or online at SamsClub.com). It is the ultimate comfort at a value – whether you are using it for an air mattress or to make any bed a new one. Pair it with the Dreamfinity™ Cooling Gel & Memory Foam Pillow and cool your guests to sleep with Gel Technology. Another way to luxe up any guest room is with quality sheets. 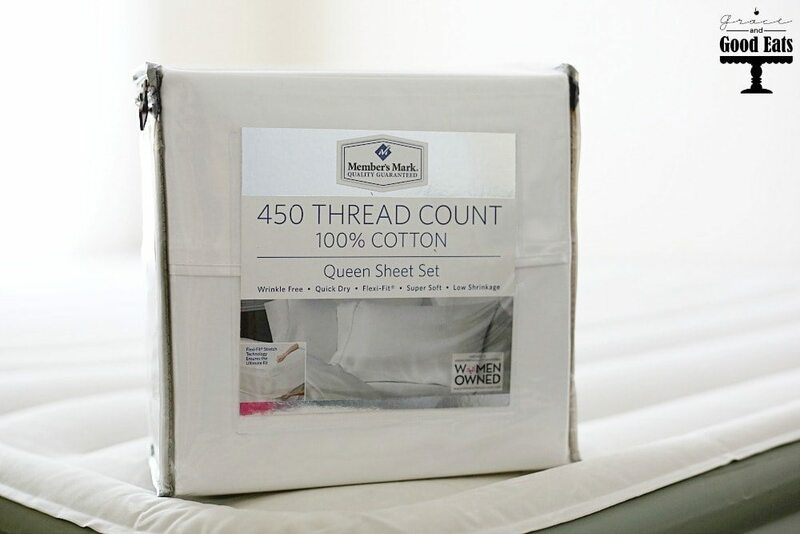 This wrinkle-free exclusive Member’s Mark 450 Thread-Count Sheet Set fits up to 16″ mattress (perfect for my air mattress + Dreamfinity™ 3” Cooling Memory Foam Mattress Topper). The queen set includes 1 flat sheet, 1 fitted sheet and 2 pillowcases and comes in a variety of colors in-club or online. 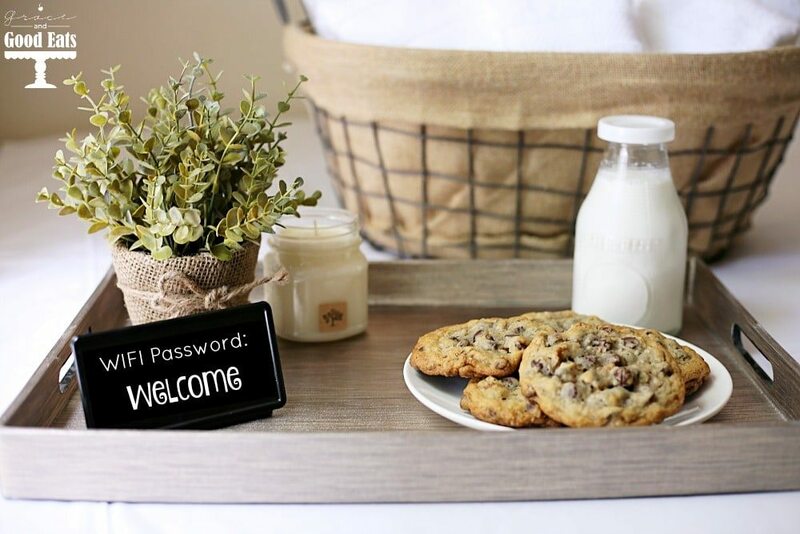 If you really want to make sure your guests come back for another visit serve them chocolate chip cookies just like some of the fancy hotels do. 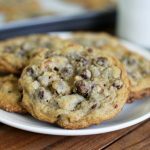 These HUGE Homemade Hotel Chocolate Chip Cookies rival some of the best I’ve ever had and are loaded with gooey chocolate chips and pecans. I know the original recipe for these copycat cookies calls for walnuts, but here in Texas we tend to prefer ours with pecans. I made sure to have a pot of hot coffee at my coffee bar ready for my Dad to go with these chocolate chip cookies all weekend long. I finished off our guest room details with a small sign listing the WIFI password and a basket of freshly laundered Member’s Mark Hotel Premier Collection 100% Cotton Luxury Bath Towels. These towels use a special “air rich” technology that ensures an ultra-soft, thick and amazingly absorbent towel. 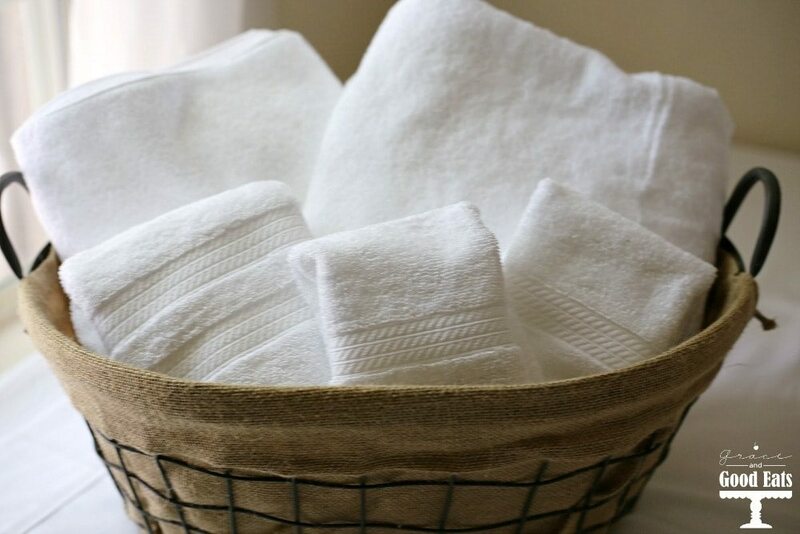 The towels, available only at Sam’s Club and SamsClub.com, also have low linting properties, as the fibers were twisted tightly and will therefore hold together better than other towels. My parents raved about the accommodations AND the cookies. These Homemade Hotel Chocolate Chip Cookies have ground oats mixed in with the flour- much like my yummy Oatmeal Chocolate Chip Protein Cookies. Don’t worry, it doesn’t make them taste like true oatmeal cookies, it just lends some heft to the cookie overall. 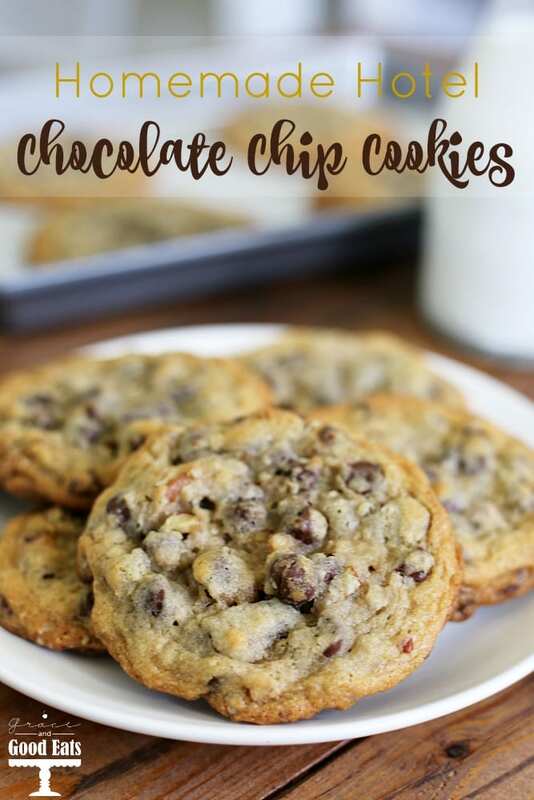 You will still get that delicious buttery taste you crave from a homemade chocolate chip cookie. These chocolate chip cookies are akin to the famous chocolate chip cookies that some hotels greet you with upon arrival or serve during turn down service. 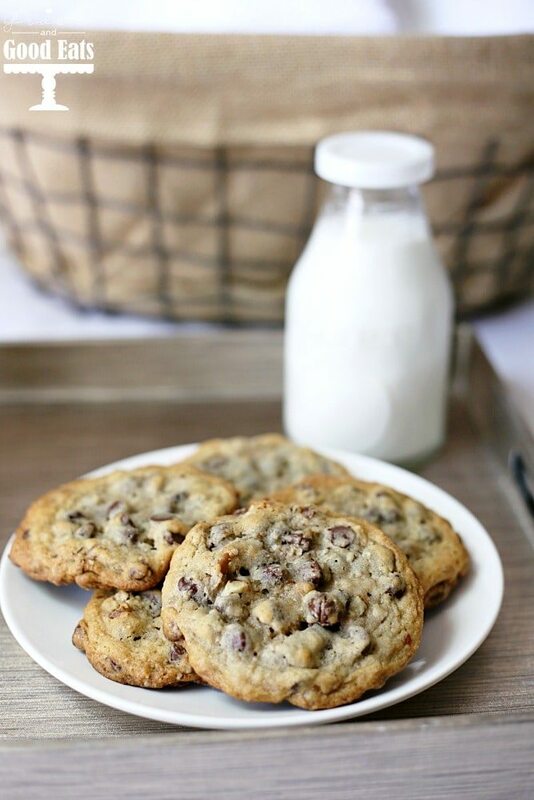 These homemade hotel chocolate chip cookies are huge and loaded with chocolate chips and pecans. Pulse oats using a food processor or blender into a fine powder. Combine oats with flour, baking soda, salt, and cinnamon in a large bowl. Use an electric mixer to cream together butter, sugars, and vanilla. Add eggs and mix until smooth. Stir in oats mixture; mix well. Stir chocolate chips and nuts into dough; mix well. Bake 13 to 15 minutes, or until cookies are light brown and soft in the middle. Dough can be portioned out and refrigerated over night. Store fully-cooled baked cookies in a sealed container to keep soft.